5 Tips For Launching Your Online Etsy Store! As part of the WeWork “Show Us Your Dream Space” campaign, I was asked to share a picture of my current workspace. Here in South Africa, we have sun practically all year round. This helps create that warm mood I love about mine! Your categories are the main sections or “magazine columns” that you feature on your blog. Your categories can be a drop down menu on your sidebar. They should be simple and logical. Use hierarchies to organise your ideas better. Try think of a catchy angle for them so you peak your viewer’s interest and stand out from the rest. Keep your design simple and appealing. Make it intuitive and well-structured. People should intuitively know how to navigate your space. Make pages along the top for sections you want to highlight. Use a category drop down menu and a follow widget wouldn’t hurt. If there are other platforms you want your viewers to know about, include those widgets also. A direct link to Twitter, Facebook or Instagram invites viewers to connect with you. Plan out each piece well. It’s always a good idea to think about a catchy title and invest time into each piece. Edit and format your posts and add great designs to them. Write in a natural tone and keep it simple. Decide on your intentions with each post. Publish often (weekly is great). If your favourite magazine missed a few issues, you’d eventually find a replacement. You write and publish something once, but who’s to say you can’t share that post once per month on Twitter, a couple times a year on Facebook or every other month on Google+? Pinterest is a lovely fresh platform with a constant stream of ideas. It’s a great way to advertise your blog. Make a board dedicated to your blog and pin your stuff to it! It will make it easier for people to find you and re-pin your stuff. Due to the “timeline” nature of most social media platforms, if you only share something once, it will only be seen by a small percent of your followers. It’s also a good idea to make an advert with your heading and URL on for sharing purposes. Your readers/clients have specific questions, desires and needs. You can start to figure out these needs by putting yourself in their shoes. What would you want to read about if you were them, visiting your blog? What tools can make things simpler for your viewers? Why do they come to your blog? Read more about figuring this out here. Remember to keep your material current and up-to-date. Try cater for a blog audience while maintaining your brand goals and sanity. This is, of course, if you are operating your blog like a business. The things you spend money on are the things you want to get value out of. The things you spend money on are the important things that you care about. The best things in life are free, but some of the things that help you create your best life cost money. Invest in marketing your blog online or elsewhere if you want the traffic that will get you money in the long run. This means short titles, bullet points and headings. Also, it means blog posts which aren’t too long. ….One that includes suggested post dates and categories. Editorial Calendar WordPress plugin is great because I like a visual representation of when I should post. Without a calendar and some type of plan, you’ll get around to that one post about that one thing on the 10th of NeverEver. Sponsored blogging (getting paid to publish promotional stuff) must be scheduled into your usual blogging routine. A lot of the time, clients/sponsors need a date for publishing. It’s good to plan ahead so you can give them an exact date. Creative people are always thinking. Sometimes I have great ideas that pop into my head which I jot down. When I get around to writing a post, I’m always excited to publish it straight away. But I’ve learnt that it’s better to save the draft and give it an ‘incubation’ period in your head. Trust me, you’ll think of different things to add over a period of just 24 hours which will add value to your post. Enjoy your own space online. Add photos of your life. Write the way you would speak in real life. See how you do this in my post Find Your Voice Online. It’s a good idea to have quality photos of yourself. These will come in handy for your “about” page, as well as any articles you write where you have personal experience. Allow your readers to connect with you! Keep a professional flavour by getting nice photos taken. It’s good for you and will be a plus for the photographer. There’s power in collaboration! That post you wrote three months ago? It totally needs a link to the post you published earlier this week because they’re heavily related and your readers will be happy to have guided/quick access to both. Always keep in mind that no matter what order you write things in, any post or page on your website has the potential to be the first post a visitor sees. P.S. Blog audits are also a great way to make sure you’ve included your affiliate links and product/service links in all the organic ways possible. Make sure to double-check your articles. No one likes a person who never responds to anything. Granted, you may be so “big time” that you can’t get to every blog comment or tweet, but none of them? I’ll accept that when you become the President of the United States. Even then, you can hire some people to help you out! There may be a new blog post you’ve written, a new eBook you can sell, a problem you can fix or a service you can offer that is lingering in questions from readers. Cultivate community around your blog so people feel they are in a safe space where they are supported and encouraged. Grow a family around your blog. You do this by being attentive to your readers. Once you have a healthy collection of quality content to lead people back to, pitch to some sites that fit your brand (or that are frequented by your ideal readers) to do a guest post. Think about larger online magazines and websites as well. These guest posting opportunities will help you build relationships and will lead new readers back to your site. If someone else is willing to say some valuable and entertaining stuff on your blog, let them. Make sure each post fits your blog, fits your readers, and is the type of quality content you want your blog to be known for. Make sure to promote your guest authors and show them love. They will likely spread the word of their guest post, which can potentially give you lots of new readers. We creatives like shiny new projects and get distracted easily. When you have lots of ideas racing through your head, stop and focus your energy on one thing at a time. Make a list. Lists are great. Giving Back This “Madiba Day”! This year for Madiba Day the Rotary Club of Algoa Bay gave back for 67 minutes – 1 minute for every year Nelson Mandela worked to make the world a better place – at The Provincial Hospital. The hospital is in Port Elizabeth, Nelson Mandela Bay, South Africa. In honour of his birthday, the call is out for people everywhere to give 67 minutes of their time to help their community in some way. Everyone has the power to change the world. The United Nations declared 18 July as “Nelson Mandela International Day” in 2009. 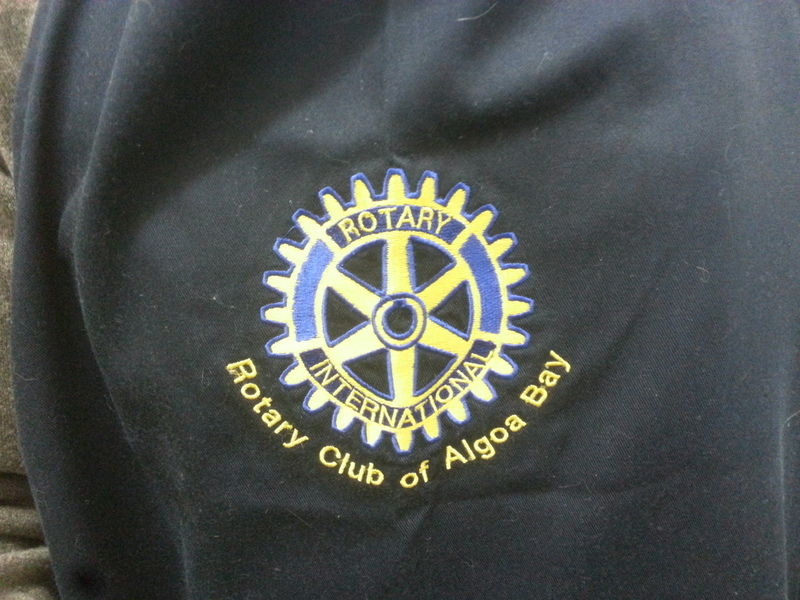 I am proud to be associated with Rotary International through my involvement with projects of The Rotary Club of Algoa Bay in Nelson Mandela Bay, South Africa. Recently Rotary initiated 3 days of free healthcare to communities across the country in their fantastic “Rotary Health Days” initiative. I covered all the social media PR & marketing for the Eastern Province, focusing on the sites in Port Elizabeth at the Nelson Mandela Bay stadium and in Uitenhage at the Volkswagen sponsored Love Life Youth Centre in Kwanobuhle. 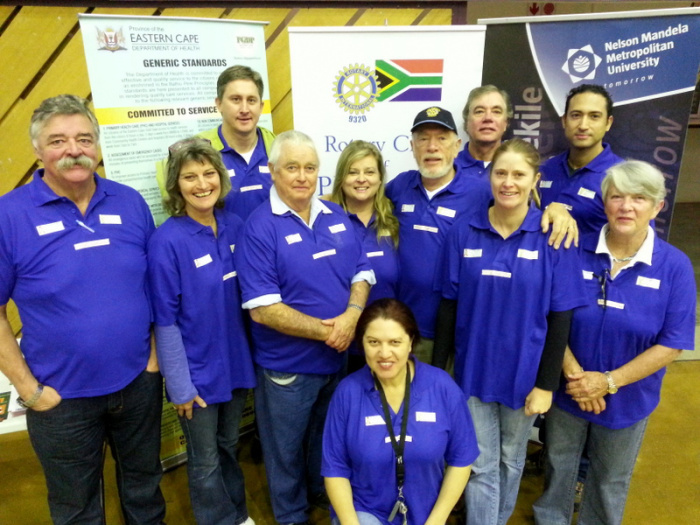 Please see our awesome album of the Rotary Family Health Days here. I was so honoured to receive active support and involvement from the Rotary Headquarters in Evanston, Illinois, via their official instagram feed here and their Facebook page here. Rotary clubs are all over the world. They bring together leaders to exchange ideas and take action to help empower youth, enhance health, promote peace, and eradicate polio. For more than 100 years, Rotarians have joined together from all continents, cultures, and occupations to take action in our communities and worldwide. 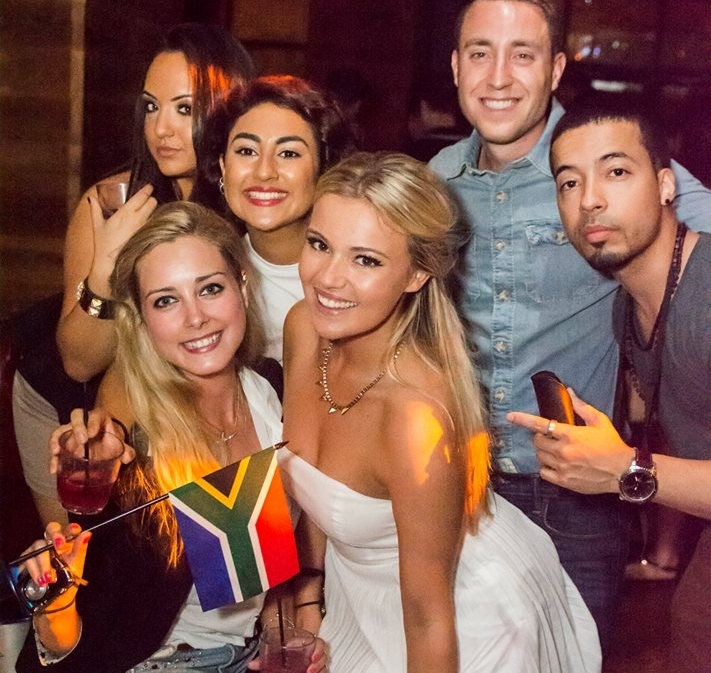 Clubs are nonpolitical, nonreligious, and open to all cultures, races, and creeds. Rotarians are volunteers with diverse perspectives and they’re committed to making lasting changes in communities globally. The goal of Rotary is to advance goodwill through improvement of health, education and alleviation of poverty. Thanks to my family’s involvement with them – my mother is the Assistant Governor of District 9370 – I’m never short of a community project to get involved with. See my photo gallery on giving back to various charities right here in Nelson Mandela Bay as well as in Cape Town. One such initiative was raising money to buy a bakkie (car) for the Ubomi Obutsha Community Centre in Kwazakhele township and handing out sweets and other goodies to their children. Ubomi is a community development project of Combined Christian Ministries to the Poor. Projects like these help me in my small way to make a difference. I believe in basic human rights and equality for all. I believe in empowering people through education and healthcare. I believe in nation-building and spreading love. Rotary helps me do this. Please support the Rotary Community on their official Facebook page or Instagram feed and see how you, too, can get involved in your city. They are currently running a photo competition with using the hashtag “#rotaryhero” next to photos you upload online. I have entered a couple of the ones we took at our Health Days – one in particular spoke to my heart. It was a photo of a man named Samuel from New Brighton township here in Nelson Mandela Bay. He was in his shack listening to the radio when he heard an interview with ambassadors for the Health Days. They were leaders from the Rotary Club of San Rafael Harbour in San Francisco who had flown in especially to be part of the Health Days here. They were handing out prosthetic hands. Samuel happened to need one. He gathered up some coins, got in a taxi and made his way to the stadium where he received immediate attention and was fitted with a new hand. For the first time since 1982, he held a cup of coffee in his dominant hand. He was beaming from ear to ear and it brought tears to our eyes and to his. He was full of a hope and joy he hadn’t experienced in over 30 years, losing his hand during Apartheid. Because of the collaborative effort of all Rotarians at the Nelson Mandela Bay stadium when he arrived (near closing time!) to work speedily and effectively to give him his hand, I nominate us for the #rotaryhero prize 🙂 Rotary is about teamwork, human rights, making a difference and – most importantly- giving people back their dignity and self-respect. Nelson Mandela believed in this too. Rotarians in Nelson Mandela Bay did just that every day during the 3 day initiative, culminating in this case on the last day. Because of it, we are all Rotary “heroes” in my eyes. This photo encompasses it all. Please “like” our photo on Facebook here! 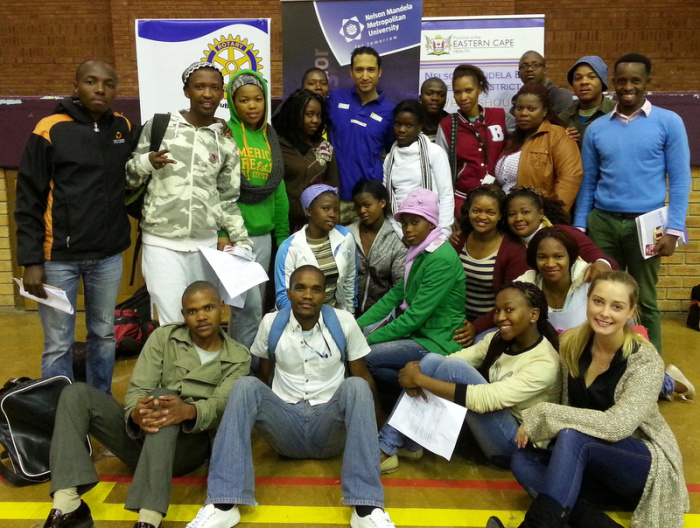 Successful Rotary Family Health Days for District 9370! 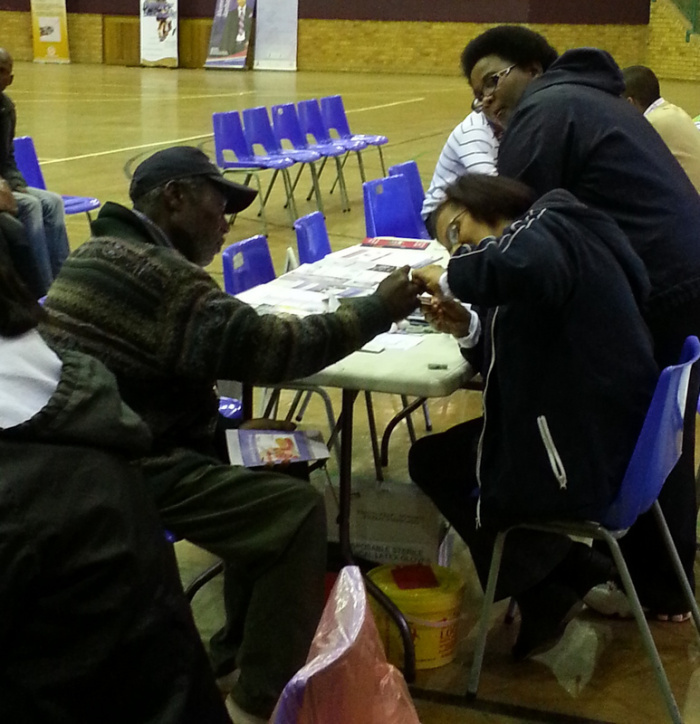 Running from April 2 – 4 2014, Rotary International together with the Department of Health in South Africa initiated 3 days of free community health checks + testing. Many add-on services partnered in order to provide a complete array of health testing. The aim? To promote a person’s basic human right to healthcare. It took place across 140 sites in South Africa (Eastern Cape, Western Cape, Kwazulu-Natal, Lesotho, Gauteng + Northern Province). Simultaneous testing was also occurring in Nigeria, Kenya + Uganda. Below are some photographs from District 9370 as they rolled out their health days! Uitenhage, in the Eastern Cape, was the official launch site of South Africa. Between this site + the site in Nelson Mandela Bay at the Nelson Mandela Bay Stadium, we tested close to 3000 people between the 2 sites over the 3 days. Offering services such as testing for blood pressure, HIV, TB, audiology, optometry, dental, cervical, kidneys + cholesterol, there was also de-worming, family planning, measles vaccinations, vitamin A injections, diabetes, blood glucose testing + prosthetic hands for the disabled. Everyone was afforded the same opportunity to become empowered with their state of health. Where there was a need, patients were referred for the correct treatment + help. The beauty of the health days is that all the health services have been combined so that families can be seen as a unit – mothers + children can get tested together. This curtails travelling expenses + loss of valuable work days. I worked as Social Media Manager for the Eastern Province of South Africa, providing updates on the developments of the Family Health Days at the sites. View all the photos at this awesome link. 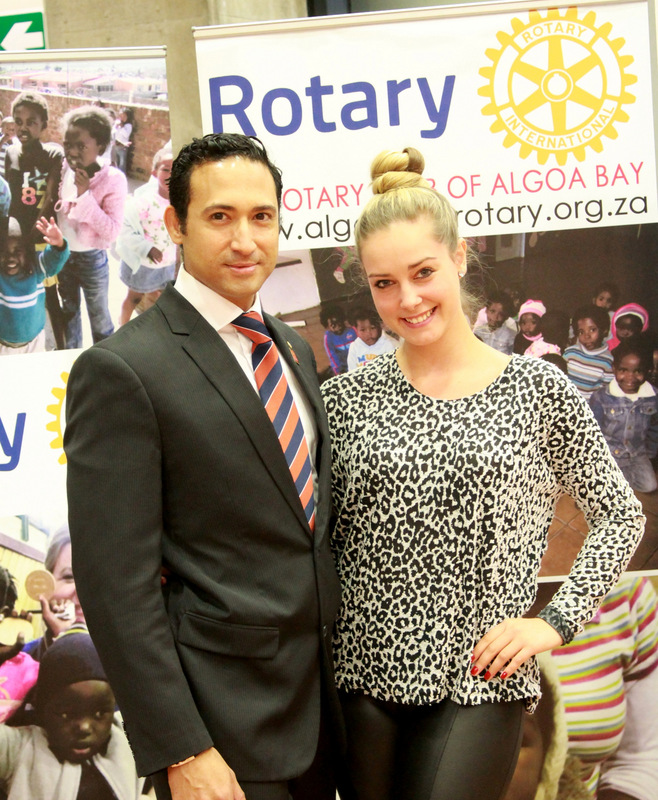 Support the official facebook page of the Rotary Club of Algoa Bay here. Join the Rotary movement globally here. Join me on Twitter here. Let’s connect on Instagram here. Anyone who knows me knows I’m proudly South African. Mandela’s passing had a huge effect on me as this country said goodbye to its most cherished soul. I was living in Cape Town at the time & all around me there were Madiba posters & South African flags waving in the streets. One day there was a huge concert to pay tribute to him at the Cape Town Stadium. Madiba has taught me so many lessons. When I think about it, he was the first one who taught me to get involved in my community where I could & work with others to strive for the better.